To make sponge: Blend yeast, water and sugar thoroughly. Let it stand 5 min. to produce a “sponge” (the consistency of a pancake batter). To make dough: Add lard, to the sponge, then most of the flour. Gradually add the remaining flour as needed, mixing until dough is pliable. Add salt. This goes in last so the salt does not retard the yeast. Using a mixer with a dough hook, mix 7-10 min., until dough is elastic and glossy. It should pull away from the sides of the bowl and cling to the dough hook, scrape down periodically. Remove dough from bowl, form a ball and set on work surface. If dough spreads, it is too soft and will need additional kneading. Knead by hand until dough is elastic and holds together. Lightly oil a clean bowl. Transfer ball of dough to bowl and turn to coat. Cover and let rise in a warm spot for 30-60 min., or until a thumbprint indentation remains. To shape rolls: Punch down dough. Grease a half-sheet pan or a jelly roll pan with vegetable shortening, then dust with cornmeal. Shape dough into about 2 dozen balls weighing 2-3 oz. each. Set rolls onto the prepared pans and let rest 10 min. Use dowel or other stick to press a dividing line into each roll, but don’t go all the way through. Oil rolls lightly with pastry brush after shaping. Cover and let rise in warm place about 45 min. When rolls are almost done rising, preheat oven to 400 F. Put a metal cup that holds about 8 oz. water at the bottom of the oven. This helps make steam which will help create the hard outside of the roll. Make starch wash: Boil 1 c. of water. Mix 1/2 – 3/4 tsp. cornstarch in a small amount of water. Combine with boiled water. Use to brush and coat tops of rolls. Leave the rolls plain, or top each rolls with either sesame or poppy seeds. 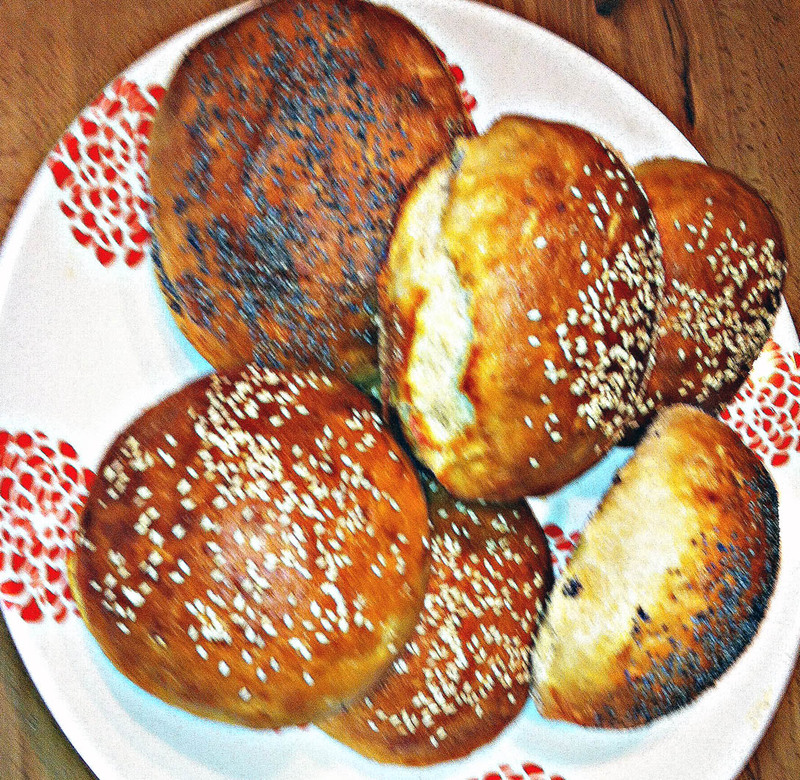 Bake rolls 17-18 min. ; removing the cup of water from the oven after about 5 min. of baking time. Rotate the rolls from the top to the bottom rack, then later turn the trays on their racks. Rolls are done with outsides are hard and they are a (light) golden brown color.